Since I started “surfing the net” on horse related topics, I’ve encountered statements made with certainty that reflect a lack of knowledge or experience on the part of the statement maker. One thing is certain about horses – it would take several lifetimes to know everything about them. That is a luxury none of us are granted, so it is a continual learning process. To contribute to that learning process, I will occasionally share stories that bust the “myths” I see on the internet. To begin, I have chosen one of my favorites: “We say that horses love to jump, but you never see a horse choose to jump when they’re loose.” In a word … false! I have always jumped my horses, whether for fun or in competition. I have trained horses to jump that ranged from warmbloods with Grand Prix jumping lines to former ranch horses. I have also “fixed” horses who developed bad jumping habits, or even fear, from bad riding. I am quite comfortable asserting that horses of all kinds can enjoy jumping. It is true that rushing is not necessarily a sign that they are enjoying it – but it’s also not a guarantee they aren’t. I will also concede that too many horses shown over fences are manhandled with harsh bits and leverage devices – but that is a separate issue. If you need to be convinced that horses enjoy jumping by proof that they will choose to do so on their own, allow me to share my favorite examples. Wicki was always on the lookout for the next fence – just point the way and he did the rest! and I once saw a photo of his former rider jumping him five feet. He was one of those horses where you just had to show him the jump, and get ready – he took it from there! But he didn’t necessarily need a rider to find his fence. At the stable where I boarded him, we kept him for a while in group pasture. It wasn’t long before the stable owner would awake each morning to find Wicki grazing in her yard. The first time it happened, I received the blame, for not putting him away or such – but it became such a regular occurrence that obviously something else was going on. Early one morning the mystery was solved. Her husband was shaving in the bathroom, which happened to look out over the pasture. He saw Wicki take off at a canter, so they rushed to a window to watch. Around he galloped, over a four foot ditch, up a short hill, over a five foot fence into the next pasture, around the bend, out over a five foot gate and trotted right to the lawn! Granted, he had a motivation other than pure joy – but that was a lot of effort for a small payoff, if he didn’t also find it fun! was just starting out to make a name for himself, and the owners of our barn were good friends with his farrier. So, they offered their place for a clinic. I could not afford it, and had another commitment in the afternoon – but the barn owners, good friends of ours, wanted me to experience it. So, they offered to pay for a session after the clinic. The round pen was set up in the end of the indoor arena, with straw bales ringing the other half, serving as seating. Pat asked me to lead Ben in and turn him loose. I let him go in the center of the round pen. He dropped his nose to the ground, casually sniffing while he wandered to the right. He looked like he was contemplating a roll. As he reached the rail, he followed it to the right a few strides, suddenly picked up a canter, turned down the center, and sailed over the six foot panels in perfect form! He had no more than two straight strides, and he picked the one five foot span that was the aisle between the straw bales – something he had to have scoped out in the few seconds of his casual stroll! I was rather amused, but was snapped to sobriety when Pat declared him a dangerous horse who thought for himself and would cause me harm. He made sure to make Ben pay for it … but that’s a story for another post! her and her mom out to the arena for some free time. On the center line was a small cross-bar set up. As she galloped around, playing, I watched in horror as she headed straight toward the jump, not really watching where she was going. At the last minute she saw the obstacle and sailed over. Nothing unusual there … but what happened next I will remember all my days! As we were laughing about her near miss, she galloped around a circle and headed right back to the fence! This time she sailed it in perfect form! My mother and I were just marveling at that when we realized that Dani was coming around again! Another perfect jump! We stood there speechless, just looking at each other … and one more time she circled around and sailed over the cross-bar, this time running off bucking and kicking, looking rather proud of herself! Until a pasture injury ended that option in mid-life, she never failed to enjoy any jumping opportunity, whether loose, on the lunge or under saddle – refusing was never even within her vocabulary. Java – Dani’s half-brother, by a different Grand Prix jumping stallion, and six years her junior. On one of his early forays into the big world, we led his mother (recovering from surgery) into the cross-country field near their pen. As he ventured around the field, he started poking around the barrel jump – two barrels laid on their side between two uprights. He reached his neck over the jump to mouth the grass on the other side, and ended up losing his balance and scrambling over the top. He landed on the other side in a little buck, and stood for a moment before taking off in a gallop. To our surprise, he turned and aimed straight at the barrel jump! Sailing over it perfectly, he galloped around for a repeat performance, before galloping off bucking! Deja vu! Rocky – He was actually a client’s horse, and not necessarily a natural over a fence. 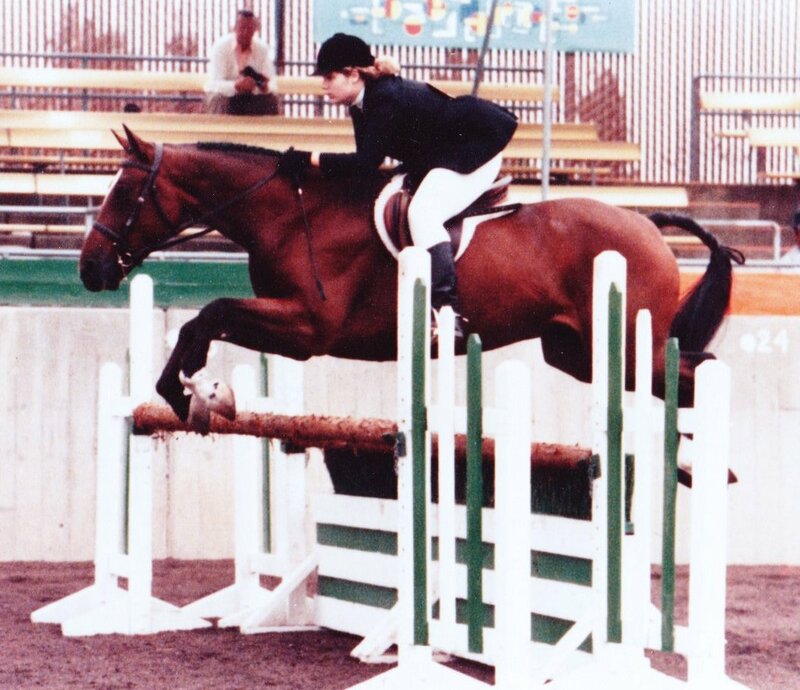 In fact, when I started him over fences, he had a disconcerting habit of landing on his knees over even small fences. However, his owner wanted an event horse, so I dedicated a lot of time to lunging him over fences. With time he got so good at it that we could lunge entire courses in canter – and it was tremendous fun for both of us! You could see him waiting for me to indicate which fence, looking from fence to me until I gave the indication – and once he had it in his sight he took over. I could actually send him to a jump away from me – just point and he would go with no other effort on my part! A slight touch on the lunge would turn him and he’d starting looking for the next one. 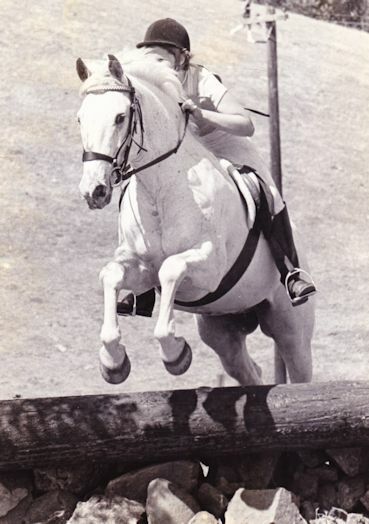 He went on to a successful eventing career through Intermediate level. I have a lot more stories, but these are some of my favorites. Noble took a jump the first time he saw one, and will gallop around picking fences, off and on, just for fun. Coffee, raised and trained as a Western Pleasure horse, learned to jump his first year with us. It was not long before he too would randomly jump fences in the arena while loose. 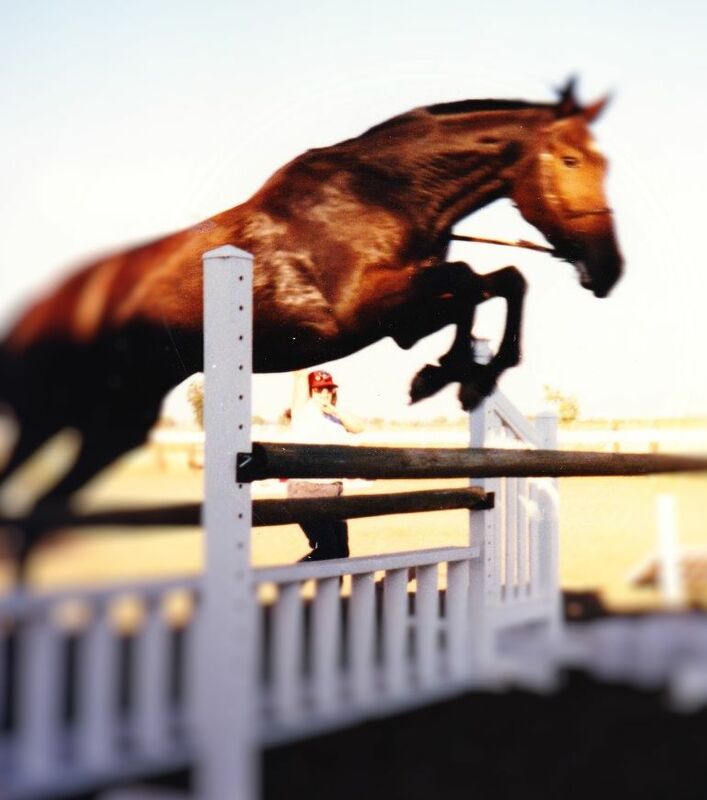 Not every horse will love jumping, and much depends upon how they are introduced to it. But don’t ever doubt that horses can learn to enjoy it – and now you hopefully won’t question whether they would choose to do it on their own! If you haven’t tried it before, introduce your horse to a little jumping. Even if you don’t picture yourself sailing over a big oxer, just lunging over little logs can be fun for both of you! This entry was posted in Just For Fun and tagged Ben, Coffee, Dani, horses jumping for fun, Java, Noble, Wicki. Bookmark the permalink.